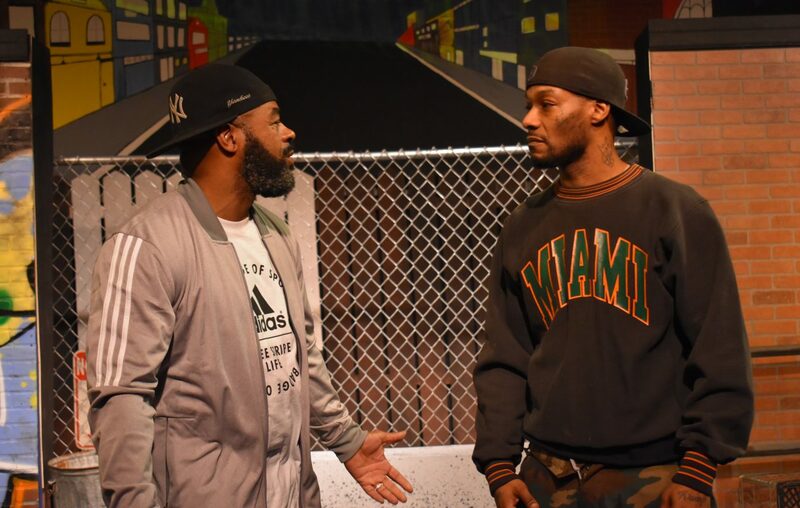 Anthony Clark, left, and Arterist “kingdom Krump” Molson star in “The Sidewalk Stageplay” presented by Paul Robeson Theatre at the African American Cultural Center. It’s evenings like this that make you proud to be in Buffalo. When two prolific artists, bound by their commitment to community and hometown boosterism, premiere their joint venture for a packed audience. If it only made you smile, to feel that kind of support in the flesh, it would be enough. But if it makes you perk up and listen, and adjust your thinking, or habits, even better. 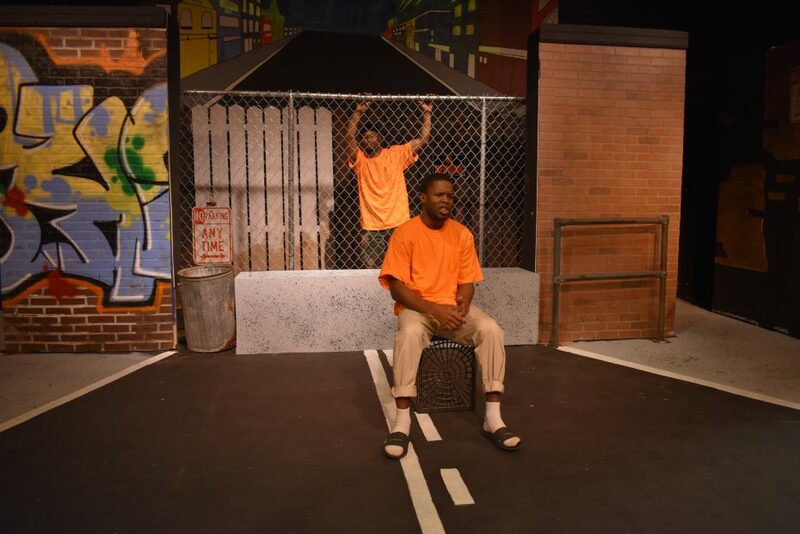 “The Sidewalk Stageplay” is the collaboration between multi-faceted artist Edreys Wajed and Paul Robeson Theatre artistic director Paulette Harris. It is a triumph in many ways. In it, Wajed and Harris marry their respective mediums and creative teams in one big pot of soup. It is at times a poetry reading, at times a narrative play, and sometimes (not enough times) a burst of expressive modern dance, but it is never one single kind of show. Nor is it for one kind of audience. As the heartbeat of the African American Cultural Center, the Paul Robeson speaks about a particular audience, yes, but presents to everyone. For many, the “Sidewalk’s” testimonials appear to echo with affirmation – that life there is systemically unjust and occasionally frightening, but always lived. For others, this will be a chance to watch, listen and learn. Here, local becomes global. In simple terms, it is a document of a place, at a time, of a people. A history. "The Sidewalk Stageplay" at Paul Robeson Theatre weaves together the talents of Edreys Wajed and artistic director Paulette Harris. But as a piece of theater – and as a world premiere, no less – there is ample room for growth. The narrative arc needs sharper focus on a more obvious protagonist; thankfully, there are many contenders. The first act sets us up with a tableau of vignettes that hint at a culmination point, where disparate characters are revealed to be more closely connected; everyone more or less has equal footing. But the second act seems to want to resolve just a few of those story-starters, and even introduce a couple new ones. A more consistent narrative is in there, but needs more room to define and carry itself. Like “In The Heights,” this play spins a modern fable of a people bound together, wanting to be heard, recognized and valued; like Miranda, Wajed narrates the lives he knows all too well. Harris brings considerable theatrical weight to Wajed’s solo work. The two voices work in tandem, though their styles are hardly harmonious. It’s easy to tell who penned which passage, between poetic interludes and straightforward dialogue. In a broad way, this doesn’t bother the play’s messaging one bit, but artistically there’s room to tighten, edit and align. On a directing note, the first act runs too long for a show of vignettes, and (as is a common note in this space) scene transitions often drag their feet. The 14-person ensemble is full of life and is peppered with fine performances. Some have more experience on stage than others, it is clear, but everyone shows up just the same. Particular standouts are Linda Barr, who in multiple roles (primarily of concerned mother Loretta) evokes the versatility and honesty of documentary theater-maker Anna Deavere Smith; Andy Noel as Mike, the personable young man who dreams of a life bigger than his neighborhood; and Mike Hicks, who delivers warm and meaningful words as devoted father Richard. His son, played by young Isaac Fareed, is a non-stop charmer who’s full of confidence. Promising work all around, on the birth of something new. Onward and upward. Runs at 8 p.m. Friday and Saturday, at 4 p.m. Sunday through April 7 in Paul Robeson Theatre, 350 Masten Ave. Tickets are available online at aaccbuffalo.org, at the box office or by calling 884-2013. $30-$15.